"Has a long lasting fresh citrus fragrance. Easily breaks down solids, with long lasting performance. Our active ingredients out perform formaldehyde by over 8 times, resulting in a clean germ free environment. Dosage - add 120ml of Blu John per 20 litres of holding tank capacity and prime with 2 litres of clean water." 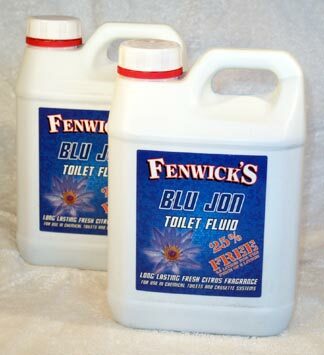 Another great product from Fenwick's. Fresh and clean fragrance and, like the Pink Toilet Rinse, this is not as thick as other products which makes it much easier to fill up the measuring cup on the holding tank without making too much of a mess! It broke up the toilet paper in the toilet with no "pyramiding" of the waste in the holding tank. We think it's well worth buying! Have you used Blu Jon? Click here to let us know what you thought of it and we will add your comments to this page.